You probably already use a lot of platforms to get the data analysis you want for your clients: Facebook and Instagram Ads, AdWords, MailChimp, Google Analytics, Moz, and the list goes on. Now it’s time to get all your key performance indicator's data sets into a single digital dashboard so that your client sees everything that you do. But... where do you start? 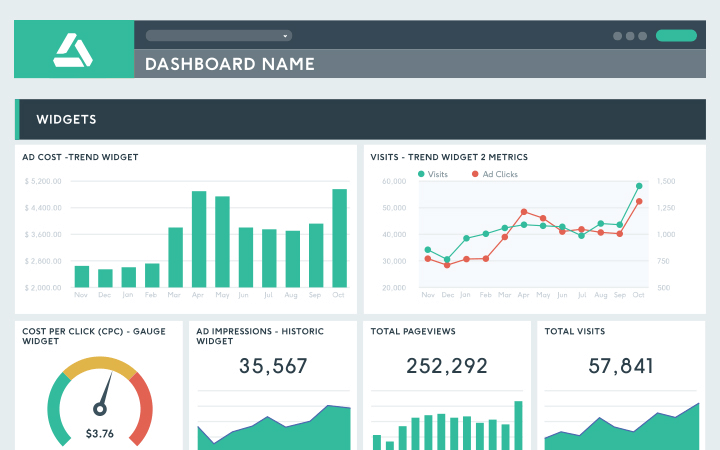 What business metrics your digital dashboard tool include? What features are must-haves? Here’s what your business needs. Your digital dashboard software has to offer some great preset templates. When you don’t have the time or the patience to build everything from scratch, you should have some preset templates that fit your needs. Whether you need a SEO report, a PPC dashboard, or a social media report, be sure that your digital dashboard solution provides complete preset KPI templates. Your KPI reporting software has to be intuitive and simple to use. Plus, creating your analytical dashboards should be easy and enjoyable. And don’t forget, the final result should look good too! You’re proud of your results, so it’s important that they be shown in a great-looking comprehensive dashboard. Help your client understand the complex data and take care of the decision making. Automating your digital dashboard is a must. Dashboard automation simply means that you let your reporting tool do the work for you. After you’ve created your perfect report with all your KPIs and metrics, simply schedule the report so that it gets sent automatically. Focus on you business goals and let us take car of all the data visualization. Wanna hear the ultimate trick of the reporting trade? DashThis! Most dashboard solutions will provide you with pretty much identical features. But DashThis is nothing like your regular business performance dashboarding tool. Apart from its awesome customer support and easy-to-use interface, DashThis brings out the best of your data by delivering your analytical goals in an awesome good-looking dashboard. That’s probably why so many digital agencies & marketing teams have chosen to trust us for their digital dashboard needs. Obviously, your digital dashboard should include the features we mentioned above. However, your perfect dashboarding tool should probably offer more options than that. Take a look at all the features that make DashThis the right choice for you. Some digital dashboard solutions will make you pay according to your data infrastructure. Others will charge you if you want your own dedicated account manager. At DashThis, you only pay according to number of dashboards. Everything else is included. Save on a custom URL and design with a white label bundle that includes both! A digital dashboard just the way you want! Our blog is always a great place to find tips of the dashboarding trade, as well as critical information on our product and updates in real-time. You can also sign up for our newsletter to get the latest info! DashThis is the power behind thousands of business intelligence dashboards. Still wondering if we’re really THAT cool? These folks seem to think so!